Martha’s mac and cheese is no joke! With over 1 ½ pounds of cheese in the sauce and buttered croutons on top, it really is the most fantastic mac and cheese recipe out there! Life doesn’t get any better than when you’re faced with a bowl of the most incredible homemade mac and cheese on the planet. That’s a fact. It’s time to forget about the woes of everyday life. About the job that stinks. About the kitchen budget that just went bust. About the nasty head cold and sore throat. Your week probably shaped up to be different than mine did last week but while the circumstances are probably different, we all deal with life’s crap. And as a reward for dealing with said crap, it’s time to belly up to a bowl of Martha’s mac and cheese. You won’t be sorry. A perfect blend of sharp cheddar and gruyere melted into a luscious white béchamel sauce makes this mac and cheese everything I’ve ever wanted in this classic dish. 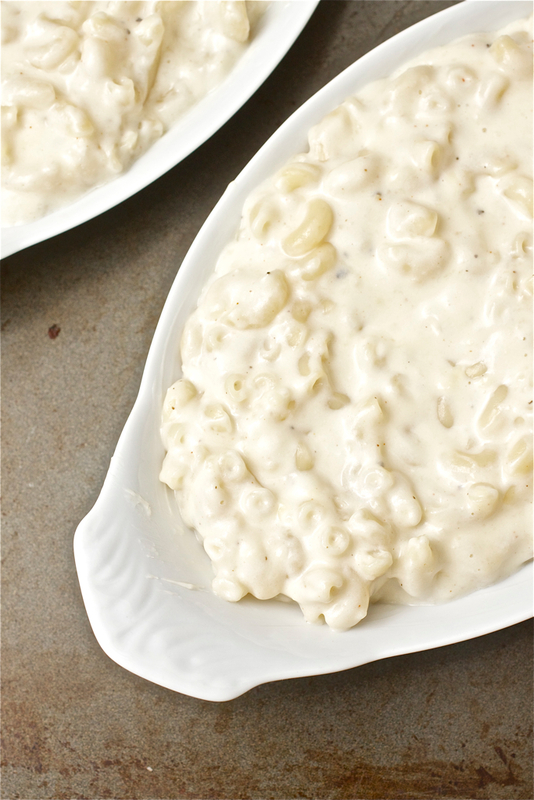 The recipe yields way more cheese sauce than you think it should but the sauce finds its way into all of the nooks and crannies of the most basic elbow macaroni and even after baking, leaves you with the creamiest baked mac and cheese ever. If you’re not familiar with croutons on top of your mac and cheese, get used to it because after trying this version, you’ll never go back to regular ol’ breadcrumbs. 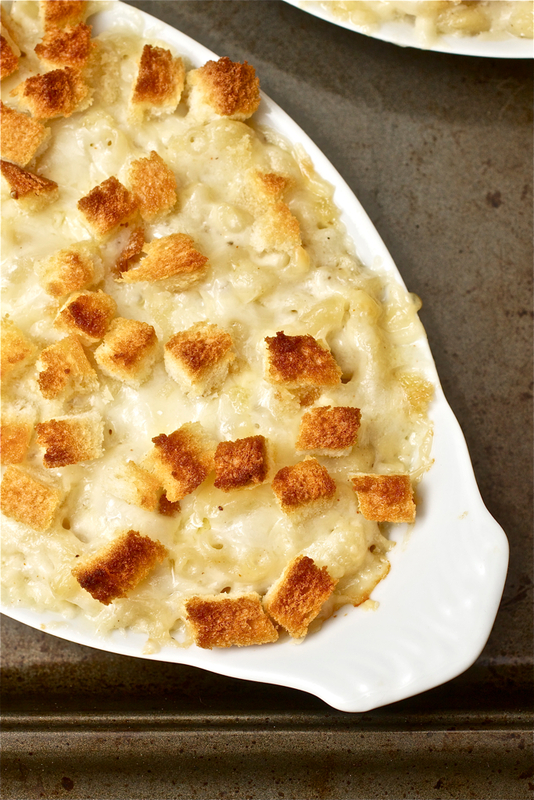 Cubed white bread gets tossed with melted butter and the oven bakes up the bread right on top of the mac and cheese – there’s no extra step to browning them like croutons! The result is a topping of buttery croutons over the creamiest mac and cheese I’ve ever had. It’s pure heaven. I made Martha’s mac and cheese recipe exactly as written – except that I halved the recipe and had no issues at all with the measurements – and wouldn’t change a single thing the next time I make it. Somethings are better left untouched. This mac and cheese recipe is one of them. Now, let’s talk cheese for a quick second and add in some fun stuff. The recipe calls for sharp cheddar and gruyere and I don’t suggestyou change this mix. The cheddar melts beautifully, as does the gruyere, but the gruyere also adds a little nuttiness…or earthiness…to this mac and cheese. It’s an amazing combination. Go for the best cheddar you can afford. I purchased mine while in Vermont last week (though any block of good white cheddar – not pre-shredded! – will work with this recipe) when Kyle and I met up with Annie and Ben. 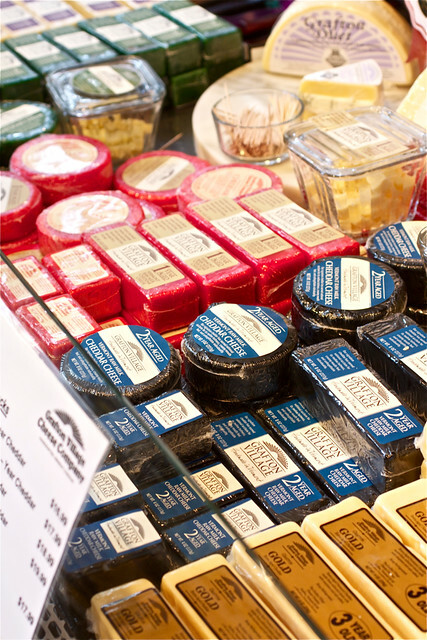 We hit the Grafton Village Cheese Company for a cheese tasting, took a walk around the quaint and sleepy Grafton Village, and had a warm and cozy lunch next door to the cheese shop. It was seriously so fabulous to finally, after nearly 5 years of being friends online and through our blogs, meet up and hang out! 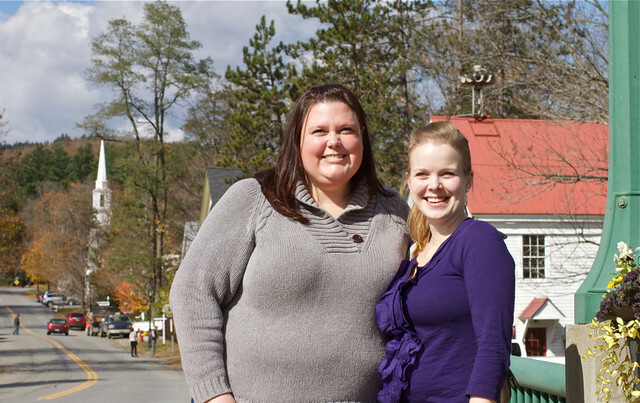 You can bet that we’re already planning another get together soon! I’ve got some additional photos of our trip to Lake George and VT in my Flickr photostream if you feel like checking them out. Heat the oven to 375° F. Butter a 3-quart casserole dish; set aside. Place bread pieces in a medium bowl. In a small saucepan over medium heat, melt 2 tablespoons butter. Pour butter into the bowl with bread, and toss. Set the bread pieces aside. Cook pasta 3 to 4 minutes less than the package instructions indicate. Meanwhile make the sauce. In a medium saucepan set over medium heat, heat milk. Melt remaining 6 tablespoons butter in a high-sided skillet over medium heat. When butter bubbles, add flour. Cook, stirring, 1 minute. Slowly pour hot milk into flour-butter mixture while whisking. Continue cooking, whisking constantly, until the mixture bubbles and becomes thick. Remove the pan from the heat. Stir in salt, nutmeg, black pepper, cayenne pepper, 3 cups cheddar, and 1 ½ cups gruyere. Set cheese sauce aside. Transfer the cooked pasta to a colander, rinse under cold running water, and drain well. Stir macaroni into the cheese sauce. Pour the mixture into the prepared casserole dish. Sprinkle remaining 1 ½ cups cheddar and ½ cup Gruyere; scatter bread pieces over the top. Bake until browned on top, about 30 minutes. Transfer dish to a wire rack to cool for 5 minutes; serve hot. ‘Tis the season for comfort food! This looks wonderful! Ok, that looks absolutely amazing! It resembles an alfredo sauce before being baked! Definitely going on my meal plan for the first week of November!!!! And I feel your pain, we all have a nasty cold in this house. Yuck! That looks amazing! I’m starting to hit ‘panic mode’ with all the things I need to get done for my grad school classes this semester. I bet a big bowl of mac and cheese would really help with that! Normally I prefer a stove top mac and cheese over baked because they are generally cheesier. But this one really might be the ultimate! Personally I hate the blue box mac n cheese-what usually makes that this great is the quality of cheese. This baked version with real cheese does look very enticing and I like the touch of the bread pieces over the top. Thanks for sharing this one. Oh my good gracious, this looks ah-mazing. This recipe sounds amazing and I love your pictures! 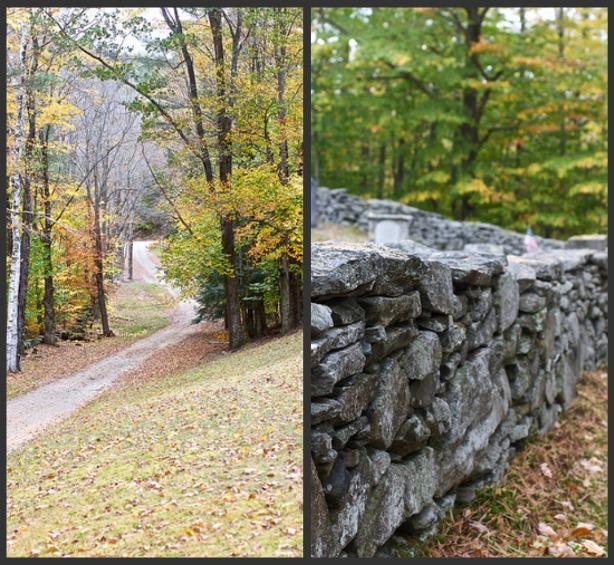 You little huzzies – gallavanting around Vermont. Glad you gals had a great time, what fun! This mac and cheese looks to-die. So cheesy and delicious. Now that is a beautiful bowl of cheesy goodness! You are right, why mess with a good thing. Vermont looks beautiful! This looks like the perfect mac and cheese recipe! I love mac and cheese – yours looks so delicious. It’s past dinner time here and I really wish I had a serving or two of that right now! This recipe looks so delicious and I’m so jealous of your delicious cheese-filled fall day with Annie. I’m so glad y’all got to meet up! I’m so going to have to try this soon! It’s finally cooling down here in Sacramento so I can actually make all this awesome autumnal/wintry foods. Ok, I am pretty much drooling. That looks out of this world! Holy wow that looks like a perfect mac and cheese. Im not allowed to deviate from BFs favorite recipe but I am going to have to sneak this one in when he isnt looking and deal with the aftermath later. 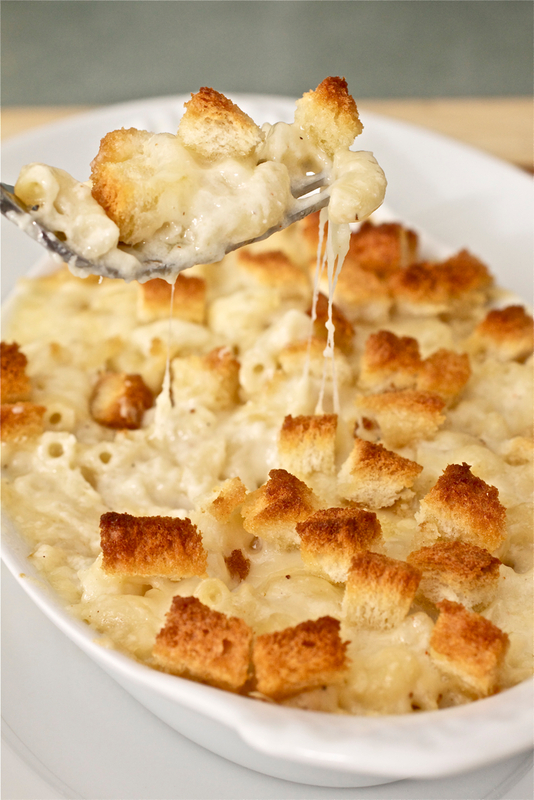 Yum, I love the white creaminess in this mac n cheese and buttered croutons sound wonderful to top it off with. Sounds like you had a nice trip – I love New England in the fall. I have made this 3 times since I found it and I can attest for its creamy goodness! I will definitely be making more of this this winter! Had to comment on this…..I made this last year. Seriousy dent to the budget with all the cheese….gruyere is outrageous, but you can used aged swiss as an alternative and it is still delicious. Have to say that this is the most amazing mac and cheese I have ever eaten. It won’t disappoint! I made this mac & cheese and the Irish bread yesterday and both lived up to and beyond expectations. The Mac was cheesy, gooey and delicious and the Irish bread (with the raisins and caraway seeds) was the best I’ve ever had and so easy to make. I look forward to trying more of these recipes as they always are as good as you say. Thanks so much. So great to hear, Maggie! This must have been one amazing meal! !